The City of Richfield, Minnesota, Richfield Historical Society, NWA History Centre, Retired Northwest Pilots Association, Minnesota EAA Chapter 25 and the Minnesota Aviation Hall of Fame sponsored a day-long observance of the lifetime contributions of one Mal Freeburg, legendary NWA pilot and one-time mayor of Richfield. Mal was to airplanes what Casey Jones was to trains. Only Mal had a better survival rate. Mal learned to fly in 1926 and established Freeburg Flying Service at Shenandoah, Iowa. He joined Northwest Airways in 1928. Sometimes Mal stripped down to his BVD's to keep cool on hot summer nights while flying the mail. He was following the Burlington tracks on his way to Chicago one night in 1930, when he spotted a flaming railroad trestle over the Chippewa River near Trevina, Wisconsin. Mal knew the railroad schedules by heart. In a matter of minutes, the crack Burlington Blackhawk was due to cross that trestle. He shoved the throttle forward and raced toward the oncoming train, banked off to one side when he saw its headlight, and dived repeatedly at the engine cab, with his landing lights blinking wildly. The engineer decided it was just another hotshot pilot showing off, and made no move to slow down until Freeburg desperately dropped several of the emergency landing flares with which his Waco was equipped. That did the trick. The train squealed to a halt two blocks short of the burning trestle. One of the passengers saved by Freeburg's quick thinking was Bobby Jones, on his way to win the U.S. Open golf championship at Interlachen in Minneapolis as part of the only "grand slam" in the history of golf. In 1932, shortly after takeoff in a Northwest Ford Trimotor, a prop blade broke on the left side engine and the engine shook loose from its mounts. As it hung from its various cables and hoses, Freeburg flew over the Mississippi River and managed to shake the engine off entirely, avoiding the danger of having it fall into a populated area. He then made an emergency landing in a farm field in Wisconsin with no injuries to his passengers or crew. In 1933 President Roosevelt presented him with the first Civilian Air Mail Medal of Honor. 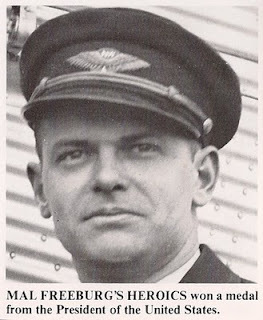 Mal Freeburg retired in 1952 and was elected to the Minnesota Aviation Hall of Fame in 1990. 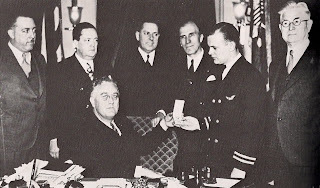 President Roosevelt presenting Mal Freeburg with the Civilian Air Mail Medal of Honor. I wish I'd known about this event! Mal Freeburg is a hero in my husband's family--a son of my father-in-law's aunt Bonnie Bryan Freeburg who grew up in Iowa. What is amazing is that Mal (Malachai's) name came up in a discussion in my own family's reminiscing...apparently Mal Freeburg was a friend of Ernest Swenson, who grew up in Lake City and was employed by one of the local nurseries there. These were daredevil men, my uncle "Pete" Eugene Peterson recalled. His mother (my grandmother) was Olga Peterson, sister of Ernest Swenson, who lived in St. Paul before and after the war.